Prompted by the news that Russian forces have entered Ukraine, German Chancellor Angela Merkel said the EU will discuss further sanctions against Russia at the extraordinary summit Saturday (30 August). The perceived ”invasion” boosted the chances that Polish Prime Minister Donald Tusk, the strongest supporter of pro-EU forces in Ukraine, would succeed Herman Van Rompuy as Council President. Ukraine’s president Petro Poroshenko said yesterday (28 August) that Russian troops had entered his country in support of pro-Moscow rebels who captured a key coastal town, sharply escalating a separatist war and prompting anger and alarm among Kyiv’s Western allies. US and British officials took strong issue with Russia’s denials that it had sent combat forces into Ukraine and threatened to impose stiffer economic sanctions on Moscow. But American President Barack Obama stopped short of calling Russia’s actions an invasion. Ukrainian President Petro Poroshenko told his security chiefs the situation was “extraordinarily difficult […] but controllable” after Russian-backed rebels seized the town of Novoazovsk in the southeast of the former Soviet republic. Earlier, Poroshenko said he had cancelled a visit to Turkey because of the “rapidly deteriorating situation” in the eastern Donetsk region, “as Russian troops have actually been brought into Ukraine”. Ukraine requested a special session at the EU summit tomorrow. Even though for several days the Council services had insisted that EU leaders will meet to only elect successors to the Council President Herman Van Rompuy and to the EU’s foreign affairs chief Catherine Ashton, it is now certain that leaders adopt conclusions on Ukraine. Merkel said EU leaders will discuss further sanctions at the summit. “We are getting reports of an increased presence of Russian soldiers and of new unrest and fresh advances of the separatists in areas that until now were very quiet,” she said. “We made it clear in March this year that if there were a further escalation, more sanctions would have to be discussed,” the German Chancellor said. French President François Hollande said yesterday it would be “intolerable and unacceptable” if it were proven that Russian troops had entered Ukrainian territory, warning that a further escalation would lead to more sanctions. “Europe will maintain [sanctions], even increase them if the escalation increases. I don’t want it, because it is neither in Russia’s interest nor our interest,” Hollande said. But diplomats who attended a preparatory meeting for the summit yesterday said no decision had been made yet on holding a special session on Ukraine. It is also unclear if Poroshenko will actually attend the summit, or only hold bilateral meetings. A presentation on the situation in Ukraine by Pierre Vimont, Catherine Ashton’s number two at the EU’s External Action Service, has been inconclusive in terms of indications which way to follow, a diplomat said. What is certain is that the Ukraine situation will feature in the summit conclusions, diplomats said. The invitation letter of Van Rompuy to EU leaders for the summit published yesterday says following the discussion on top jobs, leaders will “discuss a number of pressing international issues in the presence of High Representative Catherine Ashton”. It also appears that in the light of Ukraine situation, Polish Prime Minister Donald Tusk has become the clear favourite to take the post of President of the European Council. Tusk’s government has been among the most hawkish in Europe over Ukraine, pressing for tougher sanctions against Russia over its annexation of Crimea and involvement in an uprising by pro-Moscow separatists in the east of the former Soviet republic. This also means that since Tusk represents the centre-right, Italian Foreign Minister Federica Mogherini, a centre-left socialist, would most certainly become EU foreign policy chief. Some Eastern European countries had been opposed to Mogherini, seen as inexperienced in the Russian dossier, but they would reportedly accept her as part of a package including Tusk. Russia’s Defence Ministry again denied the presence of its soldiers in Ukraine, using language redolent of the Cold War and ridiculing what NATO presented as satellite shots of Russian troops in Ukraine. But Western governments were losing patience with Moscow’s denials. “The evidence is overwhelming,” he added. Global stock markets fell on news of the worsening crisis, which has prompted the United States and European Union to impose sanctions on Moscow and led both Russia and NATO to step up military exercises, creating the worst East-West standoff since the Soviet Union collapsed in 1991. Obama spoke by telephone on Thursday with German Chancellor Angela Merkel, and the White House said they agreed the United States and Europe should consider more sanctions. Rebel advances this week have opened a new front in the conflict just as Ukraine’s army appeared to have gained the upper hand, virtually encircling the separatists in their main strongholds of Donetsk and Luhansk. The defence and security council said it was reintroducing compulsory military service from this autumn, but conscripts would not serve in the conflict zone. Earlier, the council said Novoazovsk, on the Azov Sea, and other parts of southeast Ukraine had fallen under the control of Russian forces, and a counter-offensive by Russian troops and separatist units was continuing. It said Ukrainian government forces had withdrawn from Novoazovsk “to save their lives” and were now reinforcing defences in the port of Mariupol farther west, which a rebel leader said was the separatists’ next objective. Alexander Zakharchenko, prime minister of the self-proclaimed Donetsk People’s Republic, told Reuters in an interview. He said there were about 3,000 Russian volunteers serving in the rebel ranks. Putin called on pro-Russian rebels to provide a humanitarian corridor in east Ukraine for encircled Ukrainian government troops to leave the battlefield, the Kremlin said. Ukrainian Prime Minister Arseny Yatseniuk appealed to the United States, EU and G7 countries “to freeze Russian assets and finances until Russia withdraws armed forces, equipment and agents”. Despite Moscow’s denials, two human rights advisers to Putin said more than 100 Russian troops had died in Ukraine in a single attack on 13 August, and one of them said she considered Russia’s actions an invasion. “When masses of people, under commanders’ orders, on tanks, APCs and with the use of heavy weapons, [are] on the territory of another country, cross the border, I consider this an invasion,” Ella Polyakova told Reuters. Polyakova and Sergei Krivenko – another member of the council that has no legal powers and an uneasy relationship with the Kremlin – said their information on the Aug. 13 attack was based on accounts by witnesses and relatives of the dead. They said the troops had been in trucks filled with ammunition. “A column of Russian soldiers was attacked by Grad rockets, and more than 100 people died. It all happened in the city of Snizhnye in Donetsk province,” Krivenko said. In southern Russia on Thursday, a Reuters reporter saw a column of armoured vehicles and dust-covered troops, one of them with an injured face, about 3 km from the border with the part of Ukraine that Kyiv says is occupied by Russian troops. The column was driving east, away from the border, across open countryside near the village of Krasnodarovka, in Russia’s Rostov region. None of the men or vehicles had standard military identification marks, but the reporter saw an Mi-8 helicopter with a red star insignia – consistent with Russian military markings – land next to a nearby military first aid tent. Geoffrey Pyatt, the US ambassador to Kyiv, tweeted, “Russian supplied tanks, armored vehicles, artillery and multiple rocket launchers have been insufficient to defeat Ukraine’ armed forces. 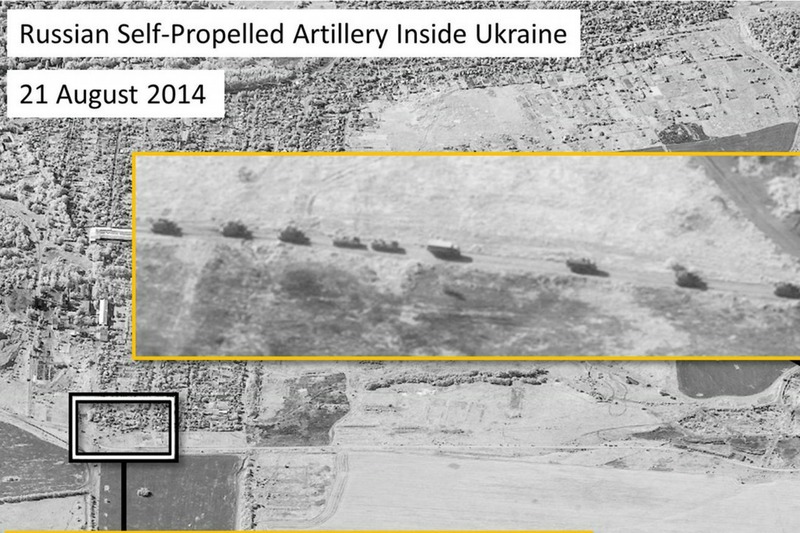 So now an increasing number of Russian troops are intervening directly in fighting on Ukrainian territory. “Russia has also sent its newest air defense systems including the SA-22 into eastern Ukraine and is now directly involved in the fighting,” he said. Energy Commissioner Günther Oettinger, who is travelling to Moscow today (29 August) for talks on a resumption of Russian gas supplies to Ukraine, said developments in the Ukraine crisis would complicate his discussions with Russian Energy Minister Alexander Novak. Oettinger said in a statement he would make "clear that the current situation will put a strain on the energy talks as the developments are contrary to the expectations from the recent summit in Minsk," a reference to talks with the Russian and Ukrainian presidents on Tuesday. Oettinger added that at the talks with Novak and representatives of Gazprom, he would also make clear that "a worsening of the situation is counterproductive to a solution of the gas talks and could potentially harm long-term energy relations" with Russia. The crisis in Ukraine erupted after its former President Viktor Yanukovich cancelled plans to sign trade and political pacts with the EU in November 2013 and instead sought closer ties with Russia, triggering protests that turned bloody and drove him from power. Moscow annexed Crimea in March following a referendum staged after Russian forces established control over the Black Sea peninsula in the biggest East-West crisis since the Cold War. Pro-Russian militants control buildings in more than ten towns in eastern Ukraine after launching their uprising on 6 April. On 11 May pro-Moscow rebels declared a resounding victory in a referendum in Donetsk and Luhansk, which the West called illegal and illegitimate. The fighting has escalated sharply after Ukrainian President Petro Poroshenko ordered on 1 July an assault on separatists. The EU resolve to punish Russia strengthened after the downing in Ukraine on 17 July of a Malaysia Airlines passenger plane, killing all 298 people on board. 194 of the passengers were from the Netherlands. Western leaders say pro-Russian rebels almost certainly shot the airliner down by mistake with a Russian-supplied surface-to-air missile. Moscow has blamed Kyiv for the tragedy. On 27 August NATO and the U.S. said Russian incursions into Ukraine took an ‘overt and obvious form’ and on 28 August Poroshenko said Russia had invaded Ukraine. A U.N. report this week said more than 2,200 people had been killed so far, not including those who died when the Malaysian airliner was shot down. What is puzzling is – why is NATO/EU not calling this what it is – an invasion of one European nation by another. & support for Ukraine? – one needs more than just words. Mike, because they are stalling having to do the inevitable and stand-up against Putin with all they hav. Germany, and Italy, France and others that hav trade & economic interests with Putin & Russia don’t want to jeopardize their association that will weaken their own countries economic strengths but there comes a time when all hav to stand up and be counted for what is proper and justice. Putin flexes his military might on countries that are much weaker pursuing his fanatical desires to recreating the old Soviet Union irregardless of who it harms. People who have languished in prosperity and comfort now must sacrifice their gains for the common good pursuing peace . Its foolish trying to be diplomatic with war mongors and people who use military & economic vices to achieve a superiority over others instead of working together for mutual benefits. I guess it all boils down to the basic Good vs. Evil?? You can take your entire narrative and replace Russia with USA and come out with the same exact results. It’s all smoke and mirrors, always follow the money when analyzing capitalists and “free market” economies. When you know the “why” everything else is chaff. It’s not a case of what is actually happening, it’s only what it can be made to look like. We have heard nothing but lies about Russia from NATO, from US ambassador to the UN Samantha Power, from assistant secretary of state Victoria Nuland, from Obama and his entire regime of pathological liars, and from the British, German, and French governments along with the BBC and the entirety of the Western media. If you hear that 100,000 Russian troops accompanied by air cover have invaded Ukraine, like what occurred in Georgia, it would be a more believable claim. How do you justify the overthrow of a duly democratically elected president of a sovereign nation? The US government orchestrated the overthrow of the elected government in Ukraine and imposed a US puppet in Kiev. If Russia can tell the “separatists” not to fight, Washington can tell Kiev not to fight. Ukraine is not a member of NATO, Article 5 does not apply. Western leaders have not begun to realize that the sanctions they imposed on Russia will not affect the Kremlin policy and additional sanctions won’t work either, remember, winter is coming. If there is one thing I have learned from my study of the Soviet Union and it’s people is that they are incredible survivors and extremely resilient. Why do you want a war with Russia? When I speak of Washington/EU puppets I speak from facts. The entire voting process was a sham. When Yanukovych won the last legitimate election he won with a majority from the east. So haw can Poroshenko declare victory when most of the east did or could not vote. Deputy of the Verkhovna Rada Oleg Tsarov, when running for president, had to instead, run for his life as many more MP’s from the east had to. When the communists deputies in the Verkhovna Rada voted against the war with the separatists their party was dissolved against their constitutional rights. Ukraine is relieved as threat of democracy recedes.